Yet another 10 new double-deck buses are going on the roads of East Yorkshire this weekend, the first part of an order for 20 similar buses, worth £3.5 million, which the company has ordered for delivery in 2009. The other 10 are due to be delivered in the summer. This brings to a total of £53 million that EYMS has invested in new buses and coaches since the company was purchased through a management buyout in 1987, £40 million of which has been spent since EYMS came under sole ownership in 1997. 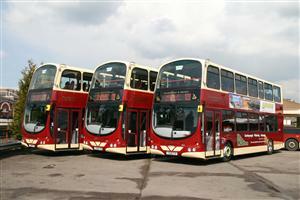 The buses are very similar to others which have been delivered in the last three years. They have Volvo chassis built in Sweden with bodywork by Wright’s of Northern Ireland, and all 20 will feature the usual easy-access, one-step entry, and 11 camera CCTV systems covering both inside and outside the buses for both safety and security. Once again EYMS has specified seats which are more comfortable than the standard, with deeper cushions and headrests, since the first 10 buses will be allocated to the longer routes between Hull and Hornsea, Withernsea, Elloughton and Goole. The allocation of new buses to these routes allows the company to move other older low-floor buses onto shorter routes, and this will mean more buses in Hull will be wheelchair-accessible with easier access for all passengers.